Connecting as a couple with a weekend getaway. Sally heard the squeals of her young children as she entered her front door and was seized by her 3 year old and 5 year old. “Mommy, I missed you,” reported her daughter. Married seven years, Sally and her husband Dean just returned from a night away from the kids, happier and closer as a couple. As a couple, you and your spouse need to take the time to cultivate your relationship. Consider it an investment in your marriage— and your family— to escape for the weekend. Here’s what else to consider before getting away. See if the grandparents can watch the kids for an overnight trip. This gives your children an opportunity to get closer to their grandparents, and a time for parents to get closer to one another. If you do not have any family members living close to home, try to find a trusted family friend with whom you could trade an overnight babysitting job. Siblings in high school also work well as babysitters if an overnight date is arranged well in advance. With childcare taken care of, discuss where you and your partner would like to go. Make this a fun and intimate conversation. Put the kids to bed and snuggle together while looking for easy vacation locations. Is a spa a preferred destination? The mountains? If one parent wants to stay at a local place and the other wants a more exotic locale, compromise on where to go this time around. For the next getaway, the other partner can pick the location. A bed and breakfast inn is a romantic choice that can be explored with ease on the Internet. An attractive benefit of B&Bs is the full breakfast that is generally included in the daily rate. View pictures of the rooms and amenities on the Internet, possibly contacting the B&B of choice for more information and a brochure. Also check out a preferred area’s motels and hotels. Web sites for hotels and motels often list the walking distance of shops and nearby restaurants. And many of the sites offer travel tips to make your stay more comfortable and relaxing. After reservations are made, discuss the babysitting details with whoever is watching your children. Ensure that the departure and arrival times are clear. Discussing possible anxiety about being away helps to resolve your concerns. Make a list of emergency phone numbers and your children’s schedules to give to the weekend caretaker. And share with your children how much fun it will be to have a sleepover at grandma’s house— or to spend the weekend with your dear friend and neighbor. 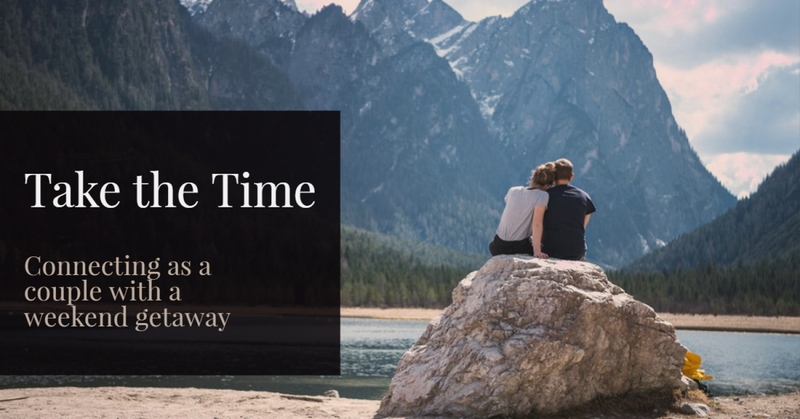 “Getaways and other ways of paying attention to the romantic and emotional side of a couple’s relationship are crucial to maintaining good communication,” says Babits. If finances are of major concern, couples can make a weekly date out for coffee or long walks or hikes. Just make your date with your spouse a routine for your family. A babysitter can be hired to watch the children for a few hours for the cost of weekly lunches out. It is a matter of priority. “It is important for parents to have one-on-one time to look forward to, something on the horizon that is planned, if not every week, perhaps every other week,” stresses Babits. Modeling the importance of the parental relationship provides security to your children. No matter where couples go, it is important for them to focus on each other and reconnect. It may surprise parents how happy their children can be while spending time with grandparents or at a sleepover at a friend’s house. The benefits from a getaway, no matter how close or far, are immeasurable.